I'm still a little behind thanks to my week off, but I still wanted to put together something resembling a TV Report Card. I'm also kind of liking the whole "What Worked/What Didn't Work" gimmick that I started last week, so I'll be keeping it around for a little while. 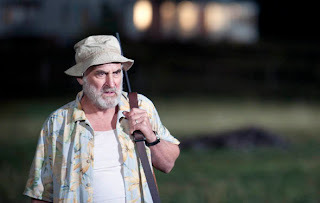 The Walking Dead: "Judge, Jury, Executioner"
What Worked: Much like most of the episode's this season, the last couple of minutes made up for an otherwise lackluster episode. While I won't be missing Dale, his death felt appropriate and earned. What Didn't Work: Everything leading up to Dale's death was pretty much unwatchable. The merry-go-round of arguments about morality was tried a few months ago when that's all this show could do, and watching them bicker became annoying, and I couldn't stand any of the characters when it was all said and done. It's too bad that the swamp walker didn't get his hands on Carl because he's by far the most annoying of the bunch, but he had a lot of competition during this one. 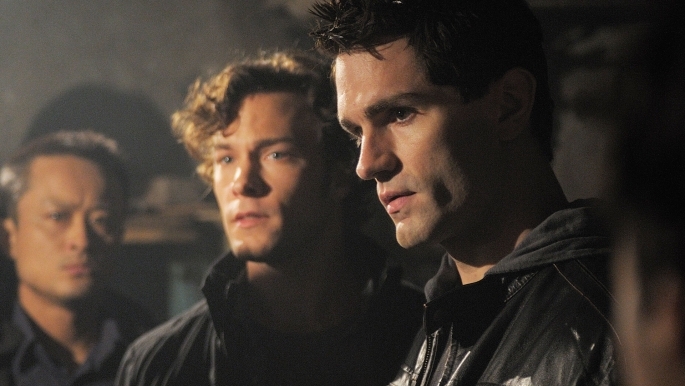 Being Human: "I've Got You Under Your Skin"
What Worked: Up until this episode, Sally's been wandering around aimlessly, but it seems like that was the point. I have to admit that I'm liking the possibility of her becoming a reaper instead of her possession arc. 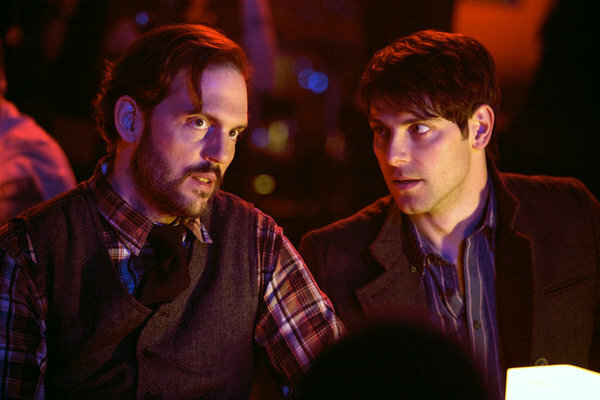 Sure, it has a Supernatural/Dead Like Me vibe, but I'm willing to overlook the similarities for now. What Didn't Work: I tend to tune out when vampire politics show up, so I wasn't too happy when Suren showed up, and I'm not as attached Henry like the writers want me to be which means I could have cared less about her need to kill the orphans and skinning him. Also, I wasn't too interested in the idea of Josh and Julia reconnecting. What Worked: Honestly, the only thing that made this episode interesting was Katharine McPhee prancing around in her undies. That's about it. It's just too bad that the song that accompanied said prancing wasn't stellar. What Didn't Work: The only thing I care less about than Julia's adoption is her stupid extra-marital affair with the guy who looks nothing like Joe DiMaggio. Oh, and her son. Other things I don't care about: Karen and Dev's relationship, Ivy and Derek's relationship, everything involving Ellis. So, pretty much every aspect of this show that has nothing to do with the actual musical. Cougar Town: "Full Moon Fever"
What Worked: The only thing that didn't irritate the hell out of me was Sarah Chalke, but that had more to do with her Scrubs' days and nothing to do with being saddled with Bobby (who I usually like). I'm sure there were some decent Bobby/Travis moments, but I can't remember them because I've blocked them out thanks to the latter's stupid helmet. What Didn't Work: Obviously, most of this episode was a miss for me. I didn't think that Jules and Andy's fight over who's in charge of the cul-de-sac was very funny (then again, nothing involving Jules is ever funny), and Laurie's sub-plot about finding a boyfriend over Twitter was asinine even by this show's standards. Speaking of, it's starting to look like Cougar Town's coming off of the rails because it's getting to weird for its own good. What Worked: This was a pretty solid episode, so I liked most of it. I enjoyed how it was successfully able to combine humor with drama, and it was nice seeing this group of friends gel in front of us. 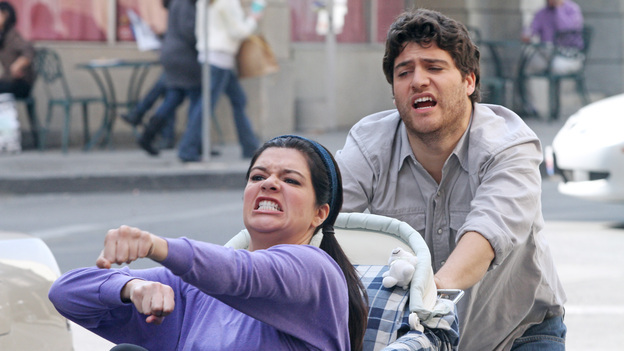 Yes, Nick has a history with Schmidt and Winston, but Jess and CeCe have become just as valuable, and it was nice seeing them bond while dealing with a possible tragedy. What Didn't Work: While I enjoyed most of this one, I was a little irked that the writers decided to lean heavily on the Nick/Jess unresolved sexual tension. I do think that they'll be a cute couple someday, but right now it's all feeling a bit forced. I also wanted a little more out of Winston, but I don't think that he's going to be getting any substantial storylines or character development anytime soon. What Worked: Pretty much everything. 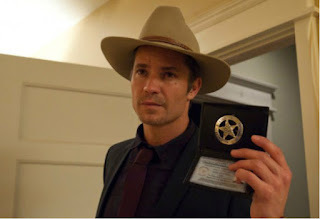 I loved how Quarles kept trying to dirty up Raylan and how he wasn't able to make anything stick. It was also fun to have Stephen Tobolowsky's character back just to keep piling on to Raylan, yet our favorite Marshal was able to survive everything that was thrown at him. 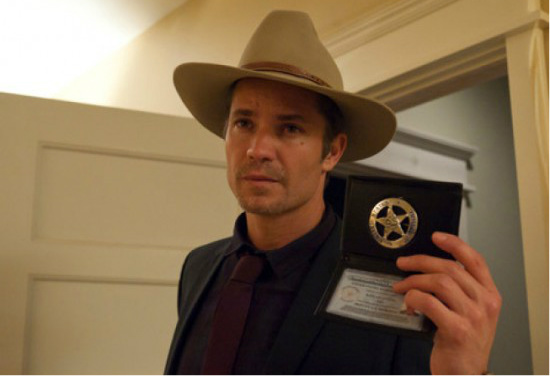 What Didn't Work: I wish we got more of Boyd because he's just as important as Raylan, so having him on the sidelines for most of the episode was a little disappointing. At least his minor B-plot was able to make the whole race for the sheriff's seat a little more interesting. It was also a little upsetting that we didn't get a ton of Limehouse, but he's still a wildcard who could make this season very interesting. Happy Endings: "The Kerkovich Way"
What Worked: Usually, I'm not a fan when the Happy Endings gang are mean and manipulative, but the way Jane tricked Brad and Dave into thinking that the latter's night with Alex never happened was more fun that it should have been (mostly due to Eliza Coupe and Damon Wayans, Jr.) I was also glad that they didn't hammer us over the head with the Dave/Alex relationship. What Didn't Work: On paper, I should have loved the Penny and Max scavenger hunt B-plot because it paired them up for the first time in what's felt like forever and 80's movie references, but it kind of fell flat. The main reason I wasn't feeling this one had to do with the fact that it wasn't fun watching them both be down in the dumps. 30 Rock: "Standards and Practices"
What Worked: This was one of those rare instances when I didn't hate the Kenneth story, but that probably had more to do with Liz's role than his. I also enjoyed the return Kaylie Hooper because she makes a fine foil for Jack in a very odd and inappropriate way. Another plus was the fact that Tracy really wasn't featured all that much which was good since Kenneth and Jenna were a part of the episode. What Didn't Work: Speaking of Jenna, I did not care for her subplot involving the people born from her frozen eggs. It was just too over the top, and it didn't help that Happy Endings did a better version of this story earlier this year. The fact that I can only take her character in small doses didn't either. What Worked: For a run-of-the-mill episode of Grimm, I liked "Plumed Serpent" a lot. The idea of the dragon lady seducing Nick intrigued me, and I loved it that Monroe frequented a fire dancing club. It was just one of those fun moments that this show does well and further proof of the fact that we need more Eddie, which we got for the most part during this one. What Didn't Work: It's look like the writers are finally going to write out Juliette for a little while, and I couldn't be happier. I understand why they wanted to give Nick a girlfriend, he needs someone to fight for, but she really hasn't been bringing much to the party, and I'm more interested in his relationships with Monroe and Hank than the one he has with her. Putting her in danger during this episode made sense, but I just didn't care about what happened to her. What Worked: This was a pretty strong episode of Spartacus. I enjoyed everything that was going on back at Vesuvius because it was nice seeing the rebels enjoy themselves for a bit before the brutish German tried to force himself of Naevia. 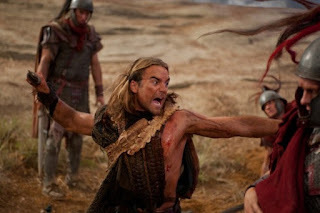 I felt that those moments worked off the existing tension between Crixus and Agron well, and it also had a sense of finality to it. Maybe Sparty's top two lieutenants can put their differences behind them once and for all. Most of what happened in Capua was good too. It was sad seeing Gannicus' brothel mate go, but at least it spurred him towards picking a side. What Didn't Work: Everything involving Ashur seemed particularly icky this time around. I'm not liking how he's using Lucretia (I know that's the point, but it's getting uncomfortable). I'm also getting a little bored by all of the scheming being done by Lucretia and Ilythia, so maybe we'll get away from that now that the latter's been kidnapped by Gannicus. As you can see, Lost Girl was absent again, and at this point I'm just going to bench the show for the foreseeable future. This move has nothing to do with the quality of the show; it's just been hard for me to catch-up since other shows have higher priority.